The new PowerVision 3000 Series with powerful processors, extensive connectivity capabilities is the latest, including Video Input on selected models and Aluminium Enclosures. 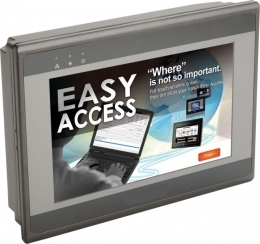 The 3000 Series is Supported by the all new EasyBuilder Pro Development System. 7.0" TFT Rear-Mount Flush front surface LED Colour Display, Touch, Widescreen, 800x480, 16.7M Colors, 32Bit RISC CPU 600MHz, Storage 128MB Flash Memory, 128MB RAM, 2 Serial Ports, 1 USB, 24VDC, Ethernet Port. PV-8071iE 7.0" Widescreen 800x480 LCD/LED Colour Display, Touch, Ethernet Port. 7.0" TFT LED Colour Display, Touch, Widescreen, 800x480, 16.7M Colors, 32Bit RISC CPU 600MHz, Storage 128MB Flash Memory, 128MB RAM, 3 Serial Ports, 1 USB, 24VDC, Ethernet Port. PV-8121XE 12.1" 1024x768 LED Colour Display, Touch, Ethernet Port. 12.1" TFT LED Colour Display, Touch, 1024x768, 16.2M Colors, Cortex A8 32Bit RISC CPU 1GHz, Storage 256MB, Flash Memory 256MB RAM, 2 Serial Ports, 1 USB Host, 1 USB Client, Ethernet Port, 24VDC. PV-8150XE 15" 1024x768 LED Colour Display, Touch, Ethernet Port. 15" TFT LED Colour Display, Touch, 1024x768, 16.2M Colors, Cortex A8 32Bit RISC CPU 1GHz, Storage 256MB, Flash Memory 256MB RAM, 2 Serial Ports, 1 USB Host, 1 USB Client, Ethernet Port, 24VDC. 7.0" TFT LED Colour Display, Touch, Widescreen, 800x480, 16.7M Colors, 32Bit RISC CPU 1GHz, Storage 256MB Flash Memory, 256MB RAM, 2 Serial Ports, 1 USB and 1 micro USB, 24VDC, Ethernet Port. Extended Temperature Range -20°C - 50°C. PV-3105P 10.4" 800x600 LCD/LED Colour Display, Touch, Ethernet Port. 10.4" TFT LED Colour Display, Touch, 800x600, 262K Colors, 32Bit RISC CPU 800MHz, Storage 256MB Flash Memory, 256MB RAM, 2 Serial Ports, 2 USB, 24VDC, Ethernet Port.